Sometimes you read a book at just the right time. It challenged me on every level. How much do I hoard and how much do I give away? 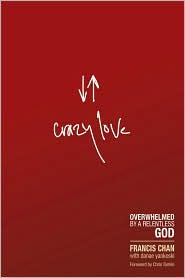 This love shouldn't even seem that "crazy" or radical inside the body of Christ, but it is. It does. This book is a must read. It isn't a big emotional exposition. It is a beautiful rendering of the command and the call of Christ on each of us. It gave me a deep desire to forego the unending diatribe of church politics and minister as deeply and effectively as possible to my poor and drug addicted neighbors. It made me want to give. The words of Christ tucked inside its cover cried out to me. We were not created to be lukewarm. I do not want to be any longer. I don't want to spend all of our money on our family and give the least amount possible. I want to be challenged by the example Francis has laid out. May Christ challenge you to think less of yourself and more of the people around you. I am challenged. This is the change we need to see. Are we good soil? Do we serve leftovers to a holy God? Are we hearers who are deceived because we do not do what the Word says? Jesus expected from all of His followers." "Lukewarm people attend church fairly regularly, are perceived as good Christians, give money to charity as long as it doesn't impinge on their standard of living, choose what is popular over what is right when they are in conflict, are moved by stories about people who do radical things for Christ but fail to act, rarely share their faith, say they love Jesus and that He is a part of their lives, try to assure you that radical devotion is not possible for the average person, think about life on earth much more than eternity, are thankful for their luxuries, feel called to minister to people in their socioeconomic status, do anything to keep from feeling guilty, play it safe, were baptized, structure their lives so they do not have to live by faith, drink and swear less than the common man, and equate their partially sanitized lives to holiness. Their lives wouldn't look much different if they stopped believing in God." Francis Chan impressed me. He convinced his congregation to forego the building of a huge 20 million dollar facility. They are building an outdoor amphitheatre instead so they give away more. He said that there are certainly going to be days when they are cold, but because they are cold, someone will have a blanket. What will we do with this love? *disclaimer. I am not calling anyone lukewarm. I wrote this to myself. do you love this book??? my friend read it and it changed her life. i am so excited about all that it will show us as a family. thanks for sharing some of what you learned! I did really enjoy the book. It was convicting to me on so many levels. I don't want to be the one who is lukewarm. I want to live the life I have been given. I hope you enjoy it! No disclaimer for me. I'll take the words as well... I've lived here almost a year and have yet to actually meet a neighbor. It's sad. May we all minister to those directly in front of us. Thanks, Em!